Caroline Steffens, 14, sits with her classmate, Gina Kermode,13, and looks around at the pale yellow portable buildings, the playing fields just beyond them, the garden behind her. This is their house, Bullis Charter School. It’s all so familiar to the reigning 8th graders. And it’s all going to change soon. “I’ve been on this campus my entire life, I always think about that,” she said. That’s nine years for Caroline, who started as a kindergartener when Santa Rita School was temporarily housed at this location, and the charter school was being planned. It’s been eight years, for Gina, who came the year after. Both agree, it’s been a great place to grow. 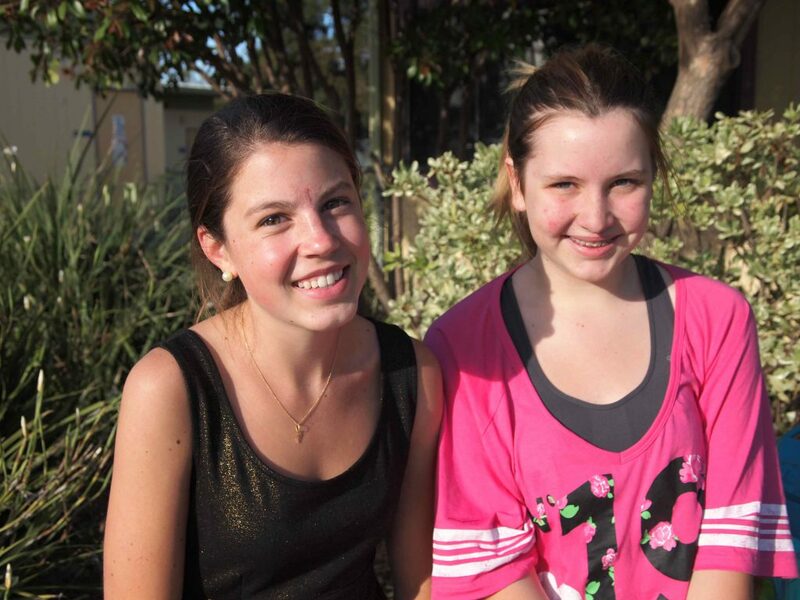 On Thursday, Caroline and Gina will join 22 of their classmates at BCS and become its first 8th grade graduating class, completing a dream for the program held since the school doors opened in 2004. Their first-grade class had only 20 students that inaugural year, six of whom are graduating with the 8th grade class. The entire K-6 school had 170 children then. They’ve seen a lot of changes, they said. Good changes. “We have more people, new play structures, more lawn,” said Caroline. This week, with graduation on their minds, they took a moment to reflect on their experiences. The teacher-student relationships. The ability to give feedback and see adjustments made to improve their learning. The opportunities. And they’ve learned a lot about themselves and their learning. They have become used to giving feedback—to their teachers, to their peers—and seeing adjustments made, or making them themselves in their group work. In the small groups they work in, they’ve learned to hold each other accountable if there is slack off, and find other tasks to assign. They like that teachers make adjustments if the individual is having difficulty learning a certain way. Caroline was having difficulty in history last year, and benefited from her teacher giving her tools that gave her other ways to understand the concepts. In science class, Gina said, students got a special paper to work with for notes. “I said, this is not going to work for me,” she said. On the other hand, it worked really well for Caroline, making her notes more organized. The teacher’s response was to ask other kids whether they experienced the same problem, and made it an option to use the new paper. The teacher-student relationships have been key, said Caroline. It’s allowed her to learn so much better. And teachers care, both girls agreed, giggling about how their teacher even taught them a little ditty about the quadratic formula they could sing to themselves during the STAR test to help cue them through their nervousness. Theater to use, and asked to put on “A Mid-Summer Night’s Dream.” By themselves. Casting, sets, rehearsals, everything. “You support these educators and give them resources they need and they fly—and the kids fly,” said Bullis principal Wanny Hersey. “This is a group of students who are supportive of each other … they learn how to set goals, how to reflect and adjust, they learn that failure is an opportunity. When the year first started, Gina said she was thinking far ahead. “In the beginning I thought, ‘The faster I get out of here the better,” she said. Now, she’s feeling excited and nervous and nostalgic. The coming year brings high school, a move from “the small fishbowl” to “the big lake,” they agreed. Trepidations aside, they’re ready. Graduation, no doubt, will be cool.